While the focus has been on the collapsing world economies and efforts to prop it by Central Banks, the mainstream media once again misses the major story of the day. As bad as a global financial might be, it pales in comparison to the oncoming collapse of the ecosystem and civilization. The international climate talks in Durban are on track to fail... sadly yet again. The United States' position appears to be to defer serious action until 2020. As the Durban deadline nears, the big carbon emitters -- U.S., China, India, Japan, Russia and Canada -- have all signaled that they are unwilling to continue with a commitment of binding emission cuts in a treaty, according to Climate Progress. And in even more disturbingly dire climate news, hungry polar bears are becoming desperate and eating their own cubs, according to BBC News. The dramatic retreat of Arctic sea ice in summer months -- which we have highlighted over and over-- leaves vast stretches of open water. And without their customary platform on which to hunt seals, bears have gone looking for alternative sources of food... their own cub bears. by the way Anonymous #1 - it's "you're" not "your"
Climate change generally spans millions of years -- not one hundred years unless of course there is something UNUSUAL happening LIKE a CHEMICAL CHANGE IN the atmosphere or in micro-organisms, for example. Remember the irridium we found in the ash layers? Unfortunately, humans do have some responsibility for the climate change due to a warming of the planet. The overuse of carbon emitting energy resources released into the atmosphere, soils, and water is the major contributing factor. Actually, it's quite extraordinary the damage humans have done to the planet in the short period of time or at least since the Industrial Revolution. Weather has nothing to do with it and should never be seen an indicator EVER for climate change. The greatest indicator for the climate change today is found in changes in chemistry compositions in the atmosphere, oceans, micro-organisms. Melting polar caps and rise in sea level are not caused by changes from the weather. That's like saying the Ice Age was caused by a change in weather. Since you asked, it is recommended that humans begin using a variety of cleaner alternative energies rather than relying soley on oil and coal because of the damage it has already done to the atmosphere, soil, and water in just a very short time period. Most people are clueless how much damage humans have done by changing the chemical composition of the atmospher & water. It is disappointing to read how once again my dear Mother Earth takes a back seat while global politics that perpetuate coal and oil-use rides shotgun. The fork in the road was way back, man, when we found bizaar chemical and genetic mutations occuring in the environment and atmosphere. Instead, we ignore the signs Mother Nature leaves, like photographs of animals cannabilizing their young and beetle larva infestation in forests, and head straight over the cliff. We can't undo the damage but if we work (agressively) changing the chemical imbalance caused by excessive overuse of land, air, and general fossil fuels (coal, crude, and natural gasses) occuring on this planet, we can lessen the global impact. Human species is on the course of mass accelerated extinction only instead of Mother Earth being at the helm, it is being orchestrated by our own greed, ignorance, and stupidity. You don't fake a 22% reduction in polar bears in the Hudson Bay area or research that this beautiful species may go extinct as early as 2050 due to loss of habitat and famine. @MNOTR - thanks for the thoughts on a serious subject. @12/13/2011 05:40:00 PM - Photo not a fake. Did you follow link to BBC above??? "The picture was taken by environmental photojournalist Jenny Ross in Olgastretet, a stretch of water in the Svalbard archipelago. "This type of intraspecific predation has always occurred to some extent," she told BBC News. "However, there are increasing numbers of observations of it occurring, particularly on land where polar bears are trapped ashore, completely food-deprived for extended periods of time due to the loss of sea ice as a result of climate change." The kill method used by the adult was exactly the same as polar bears use on seals - sharp bites to the head. "As soon as the adult male became aware that a boat was approaching him, he basically stood to attention - he straddled the young bear's body, asserting control over it and conveying 'this is my food'," the journalist recalled. "He then picked up the bear in his jaws and, just using the power of his jaws and his neck, transported it from one floe to another. And eventually, when he was a considerable distance away, he stopped and fed on the carcass." Ross said there was another bear in the area and she speculated that it might have been the mother of the dead juvenile. 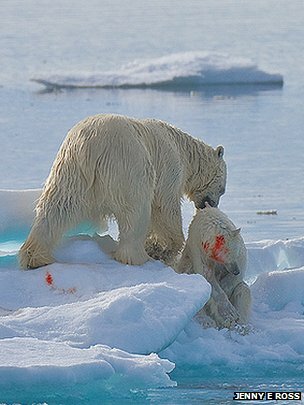 Polar bears would have driven their own species into extinction long ago if they resorted to eating the meat of their own species instead of hunting seal. Obviously this is a sign of famine due to a disappearing biome.